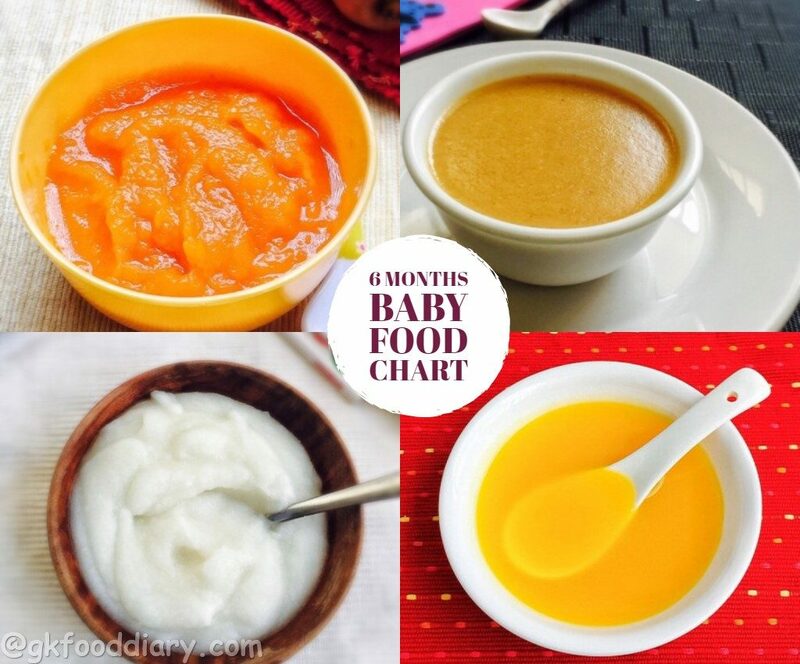 6 Months Baby Food Chart, Indian Baby Food recipes, By six months your baby will be completely ready for solids and showing signs for readiness. This post will help you to decide on what are the foods you can introduce at six months with sample food charts. Prefer homemade foods than buying packaged or ready-made foods available in the market, because homemade is safest and healthiest. Also, remember that solids food can’t replace the nutrients breastmilk or formula provides during the first year. So consider including solids in your baby’s diet as a complementary feeding. Please read on how to introduce solids to the baby before you plan a food chart for your six months baby. What foods can be included in 6 months of baby’s diet? This stage is a little tricky as six months is a starting of solids. Safe, less allergic, easily digestible, healthy and nutritious foods are recommended when you start solids for the first time. 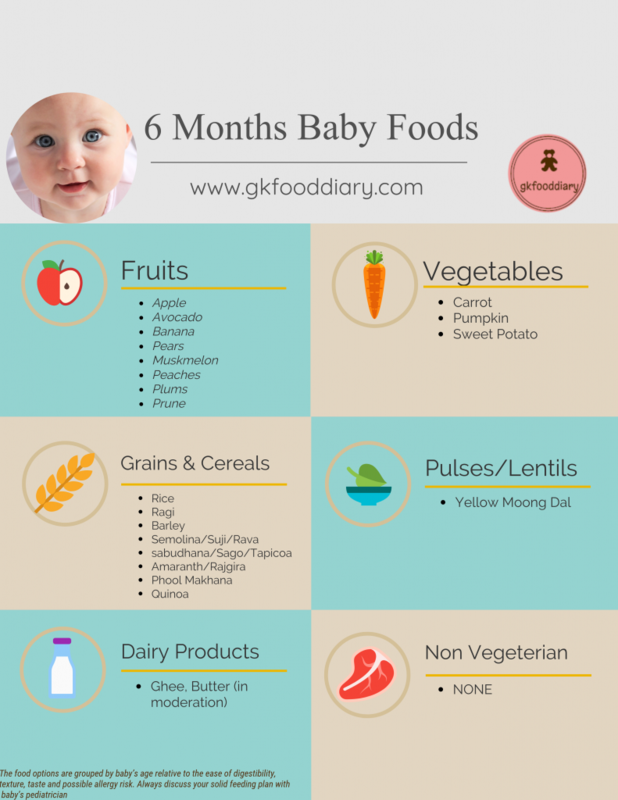 Here is the list of safe options you can include in 6 months old baby’s diet. How much quantity per day? 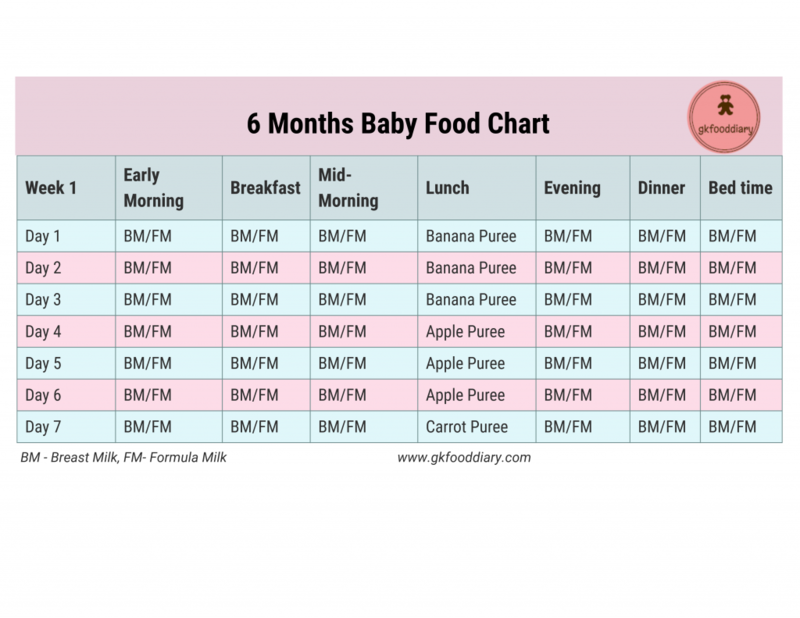 Here is the collection of 6 Months Baby Food Recipes, please customize the below sample charts with the mentioned recipes that can be included in 6 months baby’s diet based on availability, convenience, and your baby’s preference. One meal a day would do for a 6 months old baby. Gradually you can shift to two meals around 7 months. When you begin, start with small portions. Baby’s first food should be semi-liquid, gradually move to thick consistency as your baby learned to eat. Introduce one food at a time and follow 3 days rule which will help to find out allergic reactions to a particular food. Here are the sample food charts(weekly) for 6 months old baby. 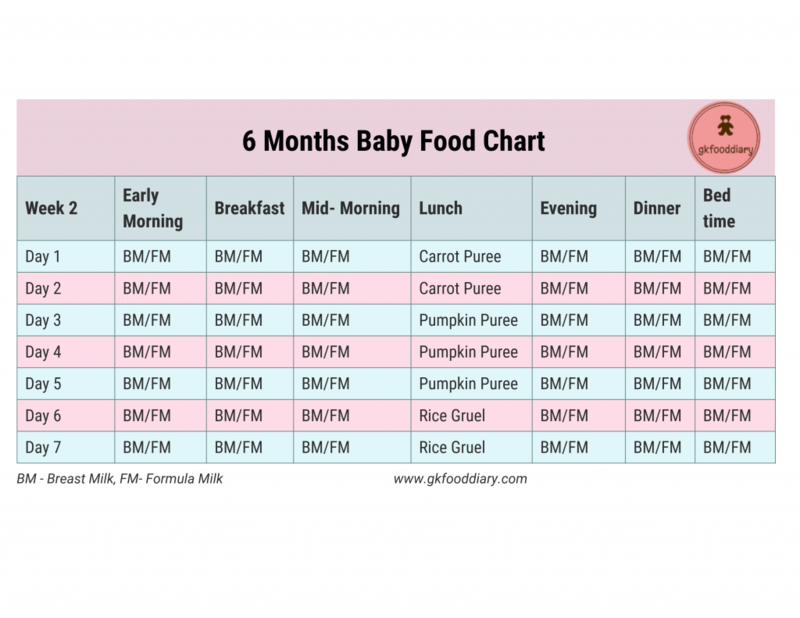 You can customize these charts with recipes for 6 months of baby food based on availability, convenience, and your baby’s preference. Salt and sugar are not recommended in baby’s food until 1 year of age. Check for allergy symptoms when you are introducing a new food to your baby and stop feeding you if you find any symptoms. 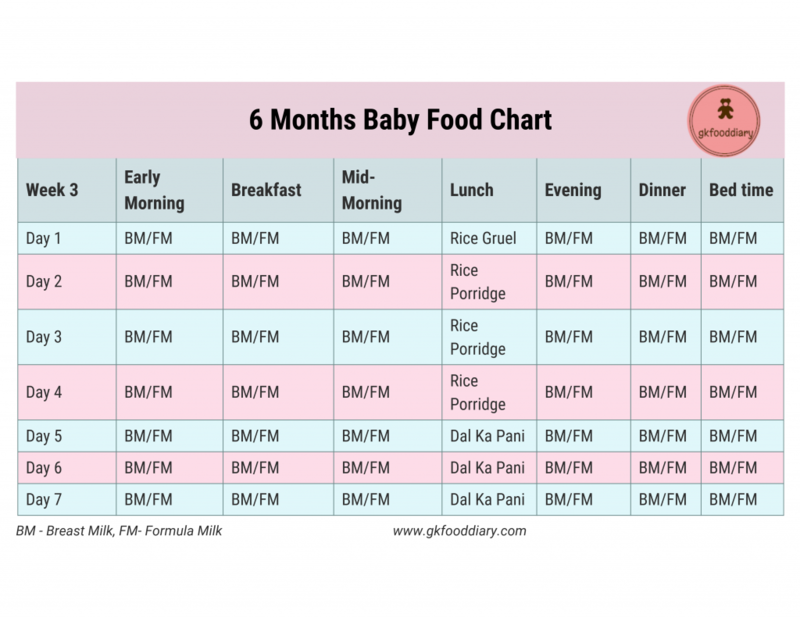 Feed your baby with breastmilk or formula milk on demand other than the timings mentioned in the chart. Good to know that ? glad that you found it useful! As a parent we are always worried about our baby's initial diet plans. Therefore in maximum time we used to consult our expert; most probably a baby is ready for solid foods after 6 months. 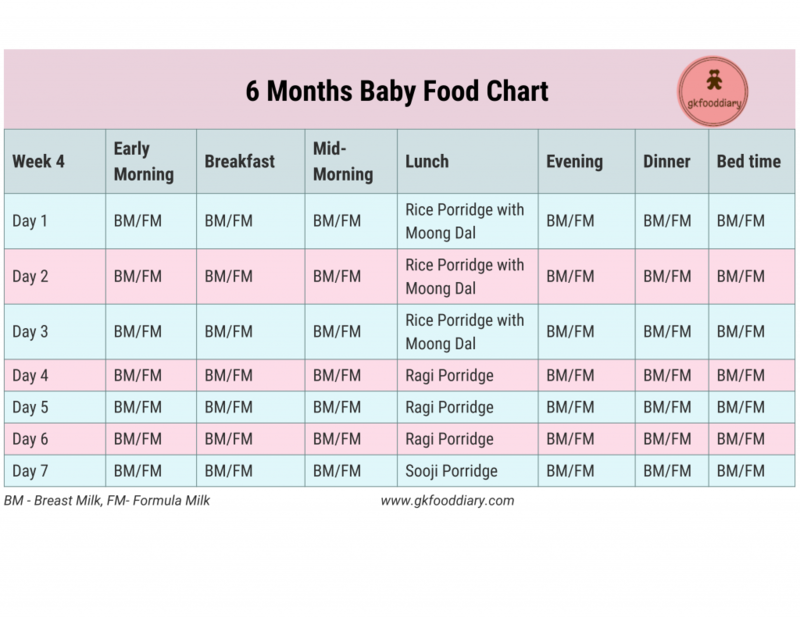 Therefore we used to follow different diet plans to deliver good amount of nutrition and protein to our baby; here in this chart we have found the complete diet plan list of a 6 months old baby. I am really thankful to get this chart. ?Glad that you found this useful! Thank you and am glad you found this useful! Yes you can skip sprouting part alone and make ragi powder. You can use organic ragi powder too, buy reliable ones. Hi, my baby is 4 months old .can I introduce solid foods like fruit and vegetable puree. For 7 months old, 2 solids per day is enough. Breastfeeding should be the major source till 12 months. If you cut down solids, baby can take more breastmilk. My daughter is six months old. I tried giving apple and banana puree she loved to eat but caught cold. My in law suggested it to give apple and banana during cold as it increases the cold. Could you please suggest me fruits and veggies that can be given when baby has cold? Hi my son is 6mnths 22 days old and i am gonna join work back from 8th of November he was always on breast milk…… Can i pump in breast milk and freeze it so that my kid can have that twice instead of formula milk? I m gonna introduce him formula milk from tomorrow. Also could you please tell me the easy way and less time consumption to express breast milk? You can buy a high-quality electric breast pump available in the market. If you can pump enough milk for a day, then you don’t need to opt for formula at all. It depends on your supply. You can store the pumped breastmilk in the refrigerator for 6-8 hours, can be frozen for a couple of months. Also to get the hang of it, practice pumping for a few weeks before you start going to work. Hi when did you update this chart for 6 months solid introduction last. Thank you, am glad you found this useful!